RF Rhett Wiseman (Nationals/High-A) hit .526 (10-for-19) with 3 doubles, a triple, 4 RBIs, a stolen base and a .625 on-base percentage. Although he did not appear in the 2017 World Baseball Classic, he did play for Team Israel in the tournament’s qualifying round. P Dean Kremer* (Orioles/AA), Baltimore’s #16 prospect, wowed fans with two wins last week, both due to 6-inning shutout performances. The 22-year-old Israeli-American yielded a combined 5 hits and 3 walks while striking out 14. His 168 strikeouts this season rank #4 among all minor-league pitchers. R.C. Orlan and Rob Kaminsky have a lot in common. Drafted one year apart, the pair are Jewish, southpaws and relievers. In addition, both recently joined the bullpen of the Akron RubberDucks (Indians/AA), where they are getting some well-deserved attention for their “lights-out” pitching (see article). Jonathan De Marte, a pitcher with the Normal CornBelters of the independent Frontier League, has been identified as Jewish. C Jason Goldstein (Athletics/AA) hit .429 (3-for-7) with 2 RBIs and his first Double-A home run. 2B Adam Walton (Diamondbacks/High-A) hit .385 (5-for-13) with 2 HRs, a double, 4 RBIs, 2 stolen bases in 3 attempts, and a .429 OBP. 2B Zane Gurwitz (Angels/High-A) hit .280 (7-for-25) with a home run, 2 doubles, 4 RBIs and a .308 OBP. C Scott Manea (Mets/A) hit .300 (6-for-20) with 2 HRs, a double and 7 RBIs. His .377 OBP ranks #2 in the South Atlantic League. C Ryan Gold (Blue Jays/A) hit .313 (5-for-16) with a home run, 3 RBIs and a stolen base. LF Tyler Benson (Padres/A-short-season) hit a game-winning single in the 11th inning on August 11. He finished the night 2-for-3 with 3 RBIs and 2 walks. SS Zack Kone (Pirates/A-short-season), a 2018 draftee, had perhaps the best game of his young career on August 21, going 1-for-1 with his first professional home run, 3 walks, 3 RBIs and a stolen base. 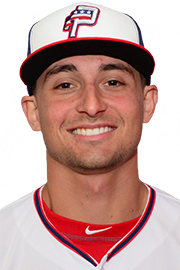 OF Albee Weiss (Twins/rookie), a 2018 draftee, went 4-for-5 with a double and an RBI on August 26. It was his first pro game with more than 2 hits. P Matthew Gorst (Red Sox/AAA) pitched 4.2 innings of one-run ball across 2 appearances, yielding 2 hits and zero walks while striking out 4. P RC Orlan (Indians/AA) pitched 2.1 perfect innings across 2 games, striking out 2 and earning his first 2 saves with the Akron RubberDucks. P Jake Fishman (Blue Jays/High-A) pitched 2.1 perfect innings across 2 games, striking out 2 and earning his 8th save. P Kenny Rosenberg (Rays/High-A) pitched 2 perfect innings on August 24, striking out one. He is 6-2 with a 5.58 ERA as a starter this season, and 3-0 with a 3.60 ERA as a reliever. P Simon Rosenblum Larson (Rays/A), a 2018 draftee, continued his remarkable rookie season with 3 innings of scoreless relief across 2 games. He yielded zero hits and a walk while striking out 6. P Sam Delaplane (Mariners/A) bounced back from a rough outing with a stellar one on August 25, striking out all 6 batters he faced. So far this season he is 4-2 with a 2.09 ERA, 9 saves in 10 chances, and 92 strikeouts in 56 innings. Among Midwest League players with at least 50 innings pitched, he ranks #2 with 14.8 strikeouts per 9 innings. P Spencer Kulman (Padres/A-short-season) pitched 5 shutout innings across 2 games, yielding 3 hits and a walk while striking out 7. P Max Lazar (Brewers/rookie) was dominant in an August 24 start, pitching 6 shutout innings on 3 hits and zero walks while fanning 6. P Jake Miednik (Indians/rookie), a 2018 draftee, pitched 1.2 scoreless innings on August 25, yielding 2 hits and zero walks while striking out one. So far this season, the Florida Atlantic alum is 0-1 with a 1.93 ERA, one save, 25 strikeouts and just 2 walks. Major- and minor-leaguers believed to be seeking employment include Ryan Sherriff, Danny Valencia, Scott Feldman, Elliott Barzilli, Dalton Blumenfeld, Mike Meyers*, Troy Neiman* and Adrian Spitz. P Zack Weiss (Reds/AA), since August 16. 1B Cody Decker* (Diamondbacks/AAA), since August 6. C Nick Rickles* (Phillies/AAA), since August 3. SS Preston Grand Pre (Dodgers/rookie), since June 29. P Brad Goldberg* (Diamondbacks/AA), since July 23. LF Zach Kapstein (White Sox/rookie), since June 15. P Mitchell Osnowitz (Cardinals/High-A), since April 9. Note to readers: Minor-League Monday does not include stats for all current Jewish minor-leaguers. Click here for a complete list of players, and then click on a player’s name to be taken to his stat page. Players who represented Team Israel in the 2017 World Baseball Classic are marked with an asterisk.